Surrender to the spell of mystique & charm as you make your way through the gates of this grand mountain top estate. 320 degree panoramic view of snow capped mountains, vineyards & valleys. Vanishing edge pool & spa frames the sunrise and melts away stress on a summer evening. 3500sf of outdoor heaven includes bar, kitchen w/ grill & smoker. 56'x30' shop w/ RV pad, hook ups & single car lift. MORE THAN 10 CAR GARAGE SPACES. Media room, office & 32x17 master. Unmatched architectural intrigue lives here., When's the last time you approached a home and had the feeling you were about to experience something exceptional? 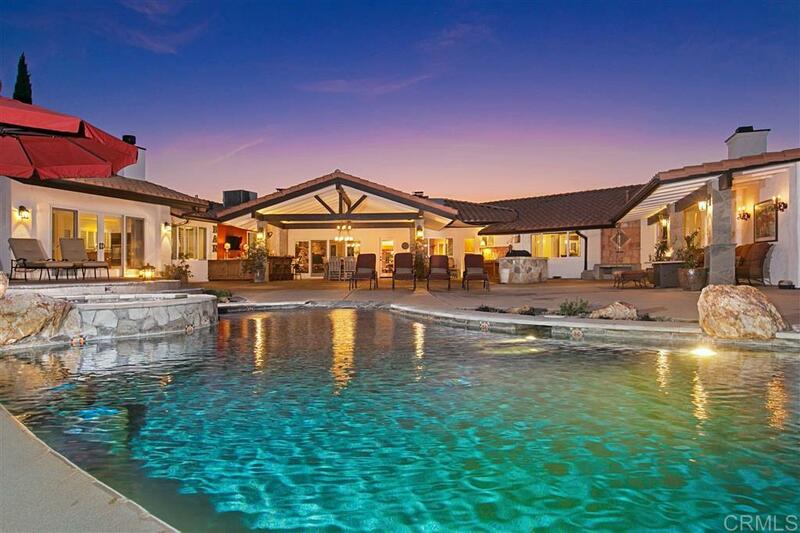 It's a feeling you won't soon forget as you arrive at this 2.86 acre mountain top estate with commanding views of the Fallbrook Valley, snow capped mountains and sun drenched vineyards. This is a socially engaging unmatched architecturally rich property with a single story allure and flow. The 32x17 Master bedroom overlooks the Fallbrook valley with an outdoor stone fireplace, spa and pool steps from the foot of your bed. Master bath is 14x16 with frameless glass shower, multiple shower heads, spa with jets and flat screen. Open kitchen flows into living, family and dining room with butler station and fireplace. 22x16 media room with room for several 19" rack mount electronics. Approximately 575sf attached guest suite with full kitchen, bedroom, fireplace and bath; perfect for guests or live ins. Outside the home and steps away is a newly built SHOP WITH 2 RV doors & a tall vehicle door, 1 car post type car lift conveys. SHOP HAS an office, half bath, upstairs storage, RV hookups and pad for multiple vehicle storage. Additional detached 4 car garage on the West lot. Property has MORE THAN 10 CAR GARAGE SPACES. Privacy, quiet and views await. Call for a tour today and we'll meet you at the top of Olive Hill Estates.